After recently re-reading William Golding’s Lord of the Flies, I am again left questioning the origins of evil. Golding takes the classical stance that there is good and bad in everyone – the angel on one shoulder and the devil on the other – yet he ultimately remains pessimistic about human nature and the fate of civilization. Golding sides with the philosopher Thomas Hobbes, suggesting that the “life of man” is “solitary, poor, nasty, brutish and short.” But where does this wickedness come from? It can be argued good and evil are human psychological concepts, projected onto outside active agents. People need something other or outside to worship, fear, or blame — something beyond their own selves — and so they unconsciously create, and then personify, supernatural forces. The semantic origins of God being Good and Devil being Devil supports this theory. 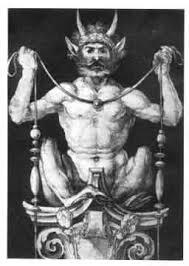 These powers are then courted, worshipped, and offered sacrifices, in an attempt to secure individual favors. By turning something other into the wicked outside element, communities can maintain an image of themselves as chosen or blessed. They are then able to avoid looking too carefully at their own souls, may deny personal responsibility, and can point the finger of blame at a scapegoat: the witch, beast, devil, bogeyman, or whatever. Over time, encounters with the supernatural have either turned into folk legends or been expanded into organized religions. The eternal battle between good and evil was then mythologized in morality tales that showed folk how to live together in civilized societies, or served as warnings against giving in to selfish desire. What are your thoughts on evil?